Sean Smith, aka Vile Rat of EVE Online's GoonSwarm, was the senior State Department official reported dead. EVE Online has lost one of its most senior members, and the Mittani - leading member of GoonSwarm - has lost a friend, in the Libyan Consulate attacks. Sean Smith, also known as Vile Rat of GoonSwarm, was initially reported dead - known then only as a senior State Department official - earlier this morning. Since that initial report several others, including Ambassador Chris Stevens, have also been confirmed as casualties in the attacks. The Mittani, in a blog post, recounted how similar events had unfolded in the past. "The last time he did something like this," said the Mittani, "he was in Baghdad in 2007 or 2008. He would be on jabber, then say something like 'incoming' and vanish for a while ... He got out from his Baghdad post physically unscathed and had some more relaxing postings after that." According to the Mittani, much the same happened this time; one final jabber from Smith, and then nothing. "If you play this stupid game," the Mittani went on to say, "you may not realize it, but you play in a galaxy created in large part by Vile Rat's talent as a diplomat." 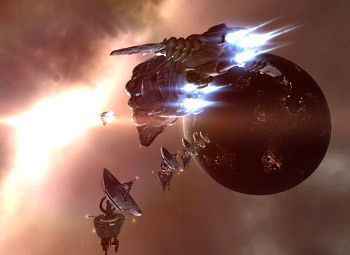 Smith had been a player of sci-fi MMO EVE Online from its very earliest days, and had been instrumental in many of the greatest events in EVE Online's history. "His influence over the grand game and the affairs of Nullsec cannot be overstated," said the Mittani. "If you were an alliance leader of any consequence, you spoke to Vile Rat. You knew him." The riots occurred in response to a low-budget movie, Innocence of Muslims, about the life of the Prophet Mohammed. It was directed and produced by Californian Sam Bacile, who has described Islam as "a cancer, period." The movie has only ever been shown once, in a mostly empty Hollywood theater, but its trailer found its way to YouTube and from there to the Arabic speaking world.